Comics are fun! Typically when we talk comics here, we’re discussing mainstream superhero titles such as Justice League of America, Aquaman, Flash, or The Avengers. Today ONCE UPON A GEEK is participating in a loosely-themed crossover with 17 other blogs entitled, “Read This Too!” The basic idea is for each blogger involved to recommend a comic they enjoy but don’t typically write about. Since we’re always discussing regular superhero comics here, I’ve decided to tackle a “funny book” for this crossover event. Thanks to our buddy Kelson from Speed Force for spearheading this interesting and horizon-expanding crossover! Today we’ll be talking about the Eisner and Harvey Award nominated series, Franklin Richards: Son of a Genius! This series of one-shots features Franklin Richards, son of Fantastic Four’s Mr. Fantastic and Invisible Woman. These out-of-continuity adventures follow the hilarious antics of Franklin, a precocious and adventurous little boy who can’t resist playing with his father’s brilliant inventions, typically with disastrous results. Franklin’s constant companion is H.E.R.B.I.E., the robot nanny who attempts to keep Franklin in line. What makes these comic strips so brilliant is they are patterned after Calvin and Hobbes! Franklin’s trouble-making behavior is reminiscent of Calvin’s, while H.E.R.B.I.E. plays Hobbes’ role as the voice of reason. Reed and Sue Richards mirror Calvin’s parents, while there is even an occasional Susie Derkins analog in Katie Power (from Power Pack). One difference between Calvin and Franklin is that Franklin actually has access to the unearthly scientific inventions that Calvin could only imagine. The artist used an adorable cartoonish style to emulate the Calvin and Hobbes look and also incorporated more realistic imagery for creatures like dinosaurs (similar to what Bill Watterson did in Calvin and Hobbes). There were 15 one-shots published in the Franklin Richards: Son of a Genius series between 2005 and 2009. Each issue was self-contained and typically contained several five-page amusing stories. The majority of stories were developed by Chris Eliopoulos and Marc Sumerak. Sumerak performed script duties on most issues while Eliopoulos drew and lettered the books. Franklin Richards: Son of a Genius began as a series of back-up strips appearing in various Marvel comics. The strips were well-received by Marvel readers and the concept was granted a self-titled one-shot, which reprinted the previously published strips. Subsequent one-shots in the series consisted of new material. These one-shots have been collected in digest and trade paperback form. Move over, Mr. Fantastic – Marvel’s First Family has a brand-new star! Franklin Richards finally hits the big time with this collection of four of his critically acclaimed one-shots! Join Franklin and his robot pal H.E.R.B.I.E. as they head into Reed’s lab for all kinds of fantastic fun, amazing adventures and more trouble than you can shake an Ultimate Nullifier at! This compilation is bound to bring out the kid in every reader! So if you’re looking for a laugh, check out these digests! If your local comic book store doesn’t have them in-stock, ask them to special order them for you! You won’t regret it! 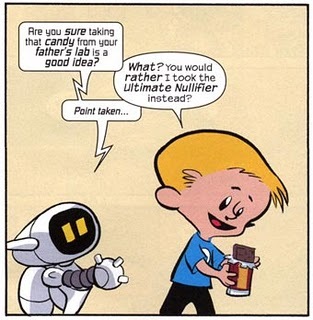 FRANKLIN RICHARDS: SONS OF GENIUSES! FRANKLIN RICHARDS: SON OF A GENIUS ULTIMATE COLLECTION BOOK 1 TPB – Released in comic stores today! This covers everything from the first two digests. FRANKLIN RICHARDS: SON OF A GENIUS ULTIMATE COLLECTION BOOK 2 TPB – In stores November 24, 2010! This covers everything from the third digest, plus the one-shots FRANKLIN RICHARDS: IT’S DARK REIGNING CATS & DOGS, FRANKLIN RICHARDS: APRIL FOOLS! and FRANKLIN RICHARDS: SCHOOLS OUT. For further information, visit Marc Sumerak’s website dedicated to these Franklin Richards comics. Please feel free to give a shout-out to any lesser-known comics that you love in the comments! I am not a huge fan of Calvin & Hobbes (I remember in high school, when I expressed my approval of the strip ending because that meant my local paper would now carry Dilbert, I was given The Evil Eye from more than one classmate), but Franklin Richards tickles my funny bone. A good counterpart to this title is the monthly Tiny Titans over at DC. Both titles are great for kids, but also a lot of fun for their parents, too. Fun and charming. Perhaps not quite as much as Tiny Titans, but still great reads. Siskoid approved! I love these Franklin Richards books, I think they’re utterly charming. I’d love to see a regular FR strip in every Marvel book, like DC used to do with Hembeck. As a bigger Fantastic Four fan than anyone should legally be allowed to be I loved this story! I wish it had only got more press at the time! These look cute and fun. Which comics should be more often. My kids love Tiny Titans and would surely love this one too!